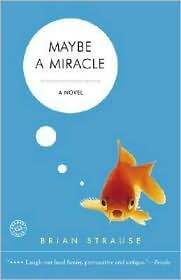 Brian Strause's debut novel Maybe a Miracle (2006) is the entertaining story of 18-year old Monroe Anderson and how both he and his family cope with a series of mysterious events. On the night of his senior prom, Monroe finds his younger sister floating face down in the family pool. He rescues her, but not quickly enough to prevent her from slipping into a coma. In the wake of the crisis, Monroe’s mother turns to religion, his father turns to liquor, and miracles start to happen. Monroe himself must decide what’s worth believing in, what’s worth fighting for, and, finally, who he wants to be. By turns humorous and heartbreaking, personal and sweeping, familiar and extraordinary, Strause’s novel takes readers on an emotional journey into America’s heartland. People Magazine describes the book as "laugh out loud funny".